The so-called "Fox News North" aka Sun TV launched is service a few days ago. The Toronto Star has been reasonably critical and not overly harsh, while still calling it full of "rookie mistakes." The Globe and Mail's John Doyle is less restrained and describes it as "dead boring." First reviews in the blogosphere have been equally scathing: "Spartan sets," "Are we watching a news network or a sketch-comedy show?" "Terrible, almost unwatchable..."
Its hosts aren't exactly household names: Krista Erickson is a former CBC TV journalist who resigned under a cloud after being too cozy with a Conservative MP. Charles Adler is a former radio host who seems to know something about broadcasting. Ezra Levant is one of Sun's higher profile hosts. Levant made a name for himself by taking on various forms of political correctness, including the human rights tribunal in Alberta. It's Levant's rants against the CBC that have caused the most notice. His approach is far to the right while devoid of serious analysis. 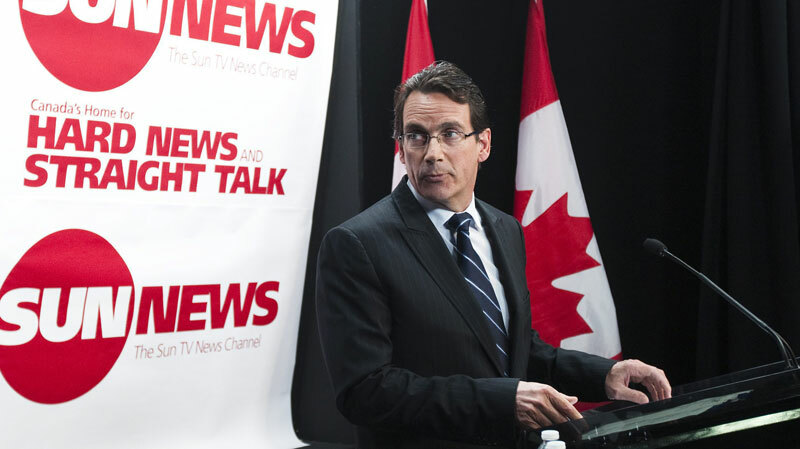 More than anyone else, his screeds are likely to allow CBC management to relax under the impression that Sun TV is mostly the harmless plaything of Quebec media baron, Pierre-Karl Péladeau. Levant will probably become the face of anti-CBC sentiment in Canada. As such, all anti-CBC criticism will be easy to ignore when lumped together with Levant's sophomoric tirades. There can be responsible criticism of public broadcasting, but you won't find it on Sun TV. Unlike some critics of public broadcasting on Fox and in conservative blogs in the US, Sun TV is -so far - neither entertaining nor pithy. Pity. But the CBC shouldn't break out the champagne just yet on the belief that the threat has passed. Sun TV is still in its infancy. It can and will only get better. And when it does, like its southern cousin, it will become a rallying point for opposition to any and all forms of standard journalistic practice especially at the CBC. Rupert Mudoch's relentless attacks on the BBC for being anti-competitive and a drain on the public purse have paid off. According to the New York Times, Prime Minister David Cameron regularly needles BBC reporters at news conferences for sending three or more reporters when other media only send one. The BBC is now is serious downsizing mode. This tactic of public shaming is regularly leveled against the CBC by this and previous governments. As a partial response, the Canadian public broadcaster has made an effort to make news gathering appear more efficient by limiting the number of reporters and "mike flashes" visible at news conferences. But it's only a gesture. Diminished quality of the reporting and a narrowing of the range of ideas may also be a consequence of letting politicians influence assignment decisions. More serious is the prospect of major cuts to the CBC budgets, especially if the present Tory minority government is returned to power next week with a fresh mandate and a majority of MPs. The name of the game everywhere is putting public broadcasters on the defensive. This well serves commercial broadcasters who resent that they must share their audiences. Attacks on NPR and PBS have caused some serious reflections inside public broadcasting in the US. It also seems to be working in Britain. With Sun TV's help, it will work in Canada. One of the highlights of Sun TV so far was watching Charles Adler visibly shamed when he attempted a balanced exploration of an issue: Armine Yalnizyan of the Canadian Centre for Policy Alternatives patiently subjected herself to Adler's ad hominem attacks and then skilfully and quietly dismantled his rhetoric about tax reduction for corporations. She was so persuasive he was almost speechless. That was much more interesting and informative than when the hosts talk to themselves, agreeing with each other. But, given the experience with Ms Yalnizyan, I doubt they'll ever attempt to be balanced again. Google the name "Krista Erickson" for a really good laugh. The blogs and comments cover what she's all about. 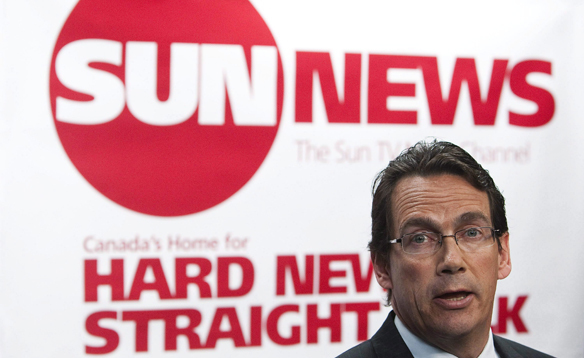 Why is Sun news hiring someone to cover politics who is sleeping with a Conservative MP? He's so proud of it, he boasts about it on his Wilkepedia page. Squirm away. Just like it was delicious seeing Peter Mansbridge in a palpable angry mood on election night, visibly disturbed about the tsunami of a Conservative majority. He also wasn't too happy having to deal with the truly inept political punditry of Evon Soloman and his sorry trinket technology. But really, all the wafer-gate gotchas masquerading as journalism took their toll. But only on Liberals and their friendly but out of touch media. The haughty, lazy hack reporters in Ottawa thought they were the 'story control freaks' but discovered that Canadians and the Conservatives have moved on. The PPG should too. 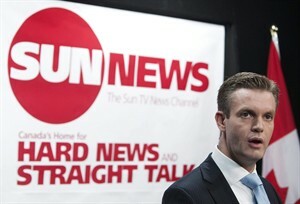 Sun TV, I love it; no more Evan Solomon on CBC Newsworld for me. It's the most interesting TV I've seen for some time- and I'm a well informed political junky. Love it! Love it! It blows everyone else away! I like nothing more than to hear the bitchy rantings of media folk who can no longer massage and manipulate the message to suit their little lefty hearts. If Sun TV is so laughable and unprofessional, surely you can afford to just ignore it. If your assumption that it appeals only to the knuckle-draggers and troglodytes, surely it will die a natural death or it will take its place along the lunatic fringe--again no trouble to you. If on the other hand, it makes you face up to the deficiencies in the present media systems then...good. Do a better job, be more investigative and less biased, and you might be accorded the respect that you have lost. It's not just SUN TV that is your problem. Mainstream media have lost a great deal of audience to capable bloggers on all sides of the political spectrum because often, they are too lazy and politically correct to report the story without tweaking it to fit "acceptable" standards. Oh my God! I could not believe the trash I hear on Sun TV. d) They pretend to be a news channel and the Conservative channel aims to create more Conservative voters by scare tactics ( learned from USA) and by brainwashing those who are easily influenced if given enough of the same message, with passion and backup 'experts'...eventually the mindset will believe it. A very sad, scary change in Canada in my opinion. Some say evils include 'FEAR, GREED, HATRED' etc. Why have I lost Sun Media News. I'm on a digital-Analoge reciever. As of Nov. 1st it was discontiued.